Hello Katie Girl: A Fabulous Floral! 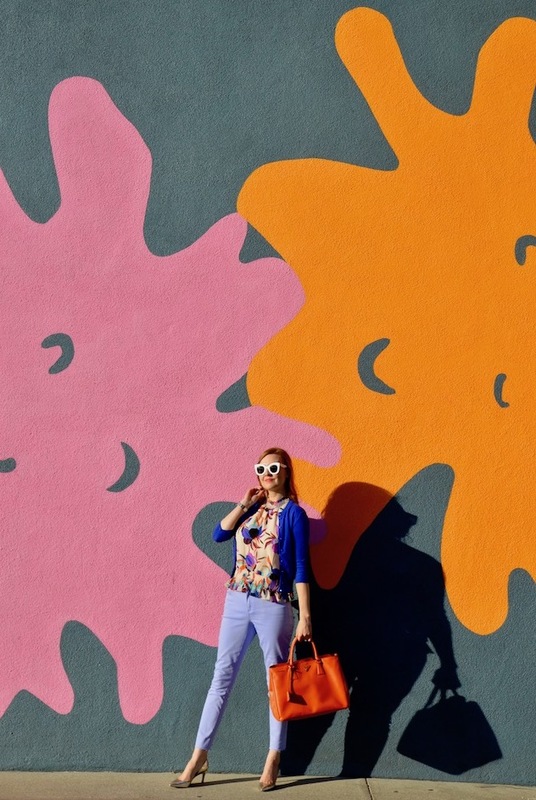 I definitely love a good floral print and a good wall and when the two collide...watch out! 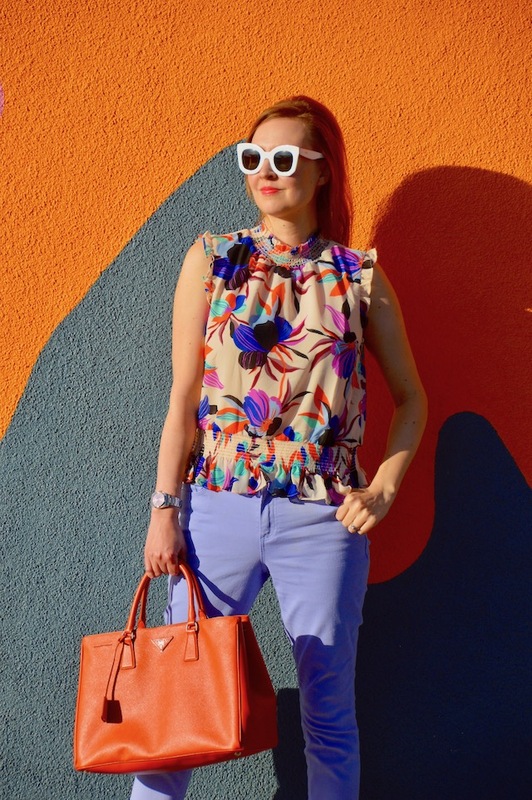 This colorful floral top is something that wasn't even on my radar until it hit the sale section at J. Crew. I don't know how I could have missed it previously but I was glad to have discovered it at a very reasonable price! It's a nice transitional piece that can be easily layered as I'm doing here with a cardigan, as the weather here isn't exactly cool but isn't exactly warm. As always, I decided to go for some bold pops of color with my lavender jeans and my orange tote. 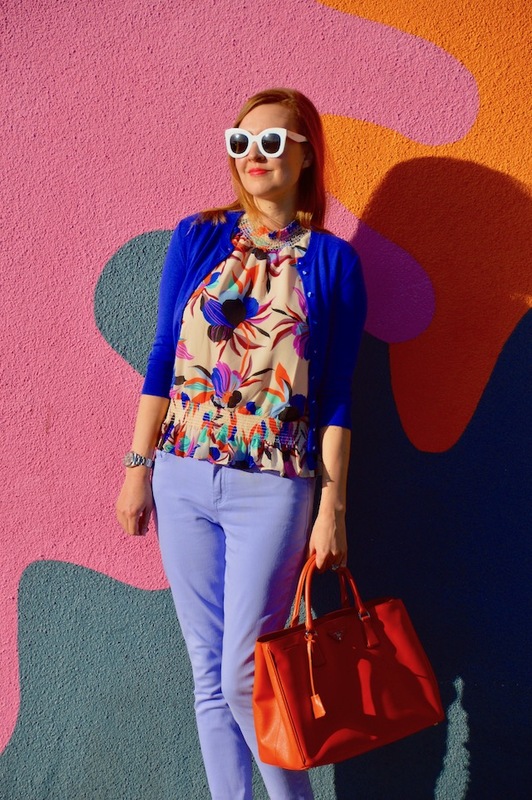 The colors not only pair nicely with my floral top but also with the wall in back of me. I think I have written about this before but this wall is on the way to one of our favorite restaurants and the day these photos were taken we were headed to a wine dinner. Speaking of perfect pairings, we had a great dinner with some excellent wine paired with each course! I need to be more more in my choice of colors! How fun! That is beautiful find! I love the smocked neckline and waist. The ruffle sleeves and hem are so fun. Of course, the floral print is the star of the show. It's a true show stopper! All these colors are making me hopeful that the rain will eventually get the memo that it's time to hit the road!